After such an epic saga of drama between Thomas Ravenel and Kathryn Dennis, it’s easy to forget that she also got with Shep Rose during the first season of Southern Charm. One person who didn’t forget was Shep himself who remembers that era pretty fondly and has no issue discussing it. Not that Shep really has an issue discussing anything. The man is an open book. He was really made for reality TV. Shep discussed his upcoming love triangle with new cast members Austen Kroll and Chelsea Meissner– which I cannot wait for since Austen is the only formidable opponent that Shep has faced when it comes to wooing the ladies. He attempted to explain the odd dynamic between him and Craig Conover. And he even reminded us all that there was a person named Jenna in Season 1 of the show. VIDEO: Southern Charm Returns Monday, March 16th! Watch The Super Trailer Now! I don’t like to brag, but a few weeks ago I chatted with Shep Rose at Rue de Jean about the upcoming season. Okay, okay…so in his version of the story, I approached him like a Southern Charm fanatic (not to be confused with a groupie looking for a hook-up, although I’m not sure which is worse), asked questions he politely skirted, and forced him to pose for a picture, but still! I can confirm that they are all, in fact, good friends outside of the show, and he was a great sport about the entire debacle. Having learned my lesson, when I spotted Cameran Eubanks the other day at the grocery store, I gave her some space…even when she pulled her buggy behind me in line. See, I can exercise restraint! She was probably grateful for it, given that I’ve fan-girled her in the past–but that was for the job, dear readers. 🙂 That said, the recently released super-trailer for the upcoming season is epic! Full disclosure: I set out to loathe Southern Charm. I anticipated watching like one would a train wreck. In the beginning, I did, but then something strange happened. It was as if the Who's Who of Whooville Charleston various towns throughout my great state were able to change this Grinch. At first I couldn't stand the thought of Thomas Ravenel, having once watched him make out at the table next to me in some oyster bar years ago. Then, strangely, I began to feel sorry for him, as he clearly just wanted to find love and a proper Senator's wife. Finally, he grew on me, much like a wart or some other weird skin abnormality, but grew on me nonetheless. I honestly think he's going to be an amazing dad. That said, I guess I'm going to have to start following politics, because T-Rav isn't planning on any more Bravo stints. Instead, he's hoping to revamp his political career with the hopes that people will remember his time on Southern Charm more than they do the time he served in prison. T-Rav certainly has a colorful past, doesn't he? He's like a modern day Ernest Hemingway without the works of literary genius. I have to admit that I was oh-so-hoping that the Southern Charm reunion would actually be filmed in Charleston, and I had grand plans of stalking Andy Cohen. No such luck…the clubhouse it is! As the reunion begins, Andy introduces the crew. Cameran Eubanks looks gorgeous, and Craig Conover is rocking some serious red pants. Shep Rose looks three sheets to the wind already, but hey, isn't that why we love him? Andy starts by asking Thomas Ravenel about new baby Kensington, and T-Rav says that she's brought so much joy to his life, he wishes he'd started a family sooner…like when he was Kathryn Dennis' age. His daughter would be out of college by now! Well last night was bittersweet! 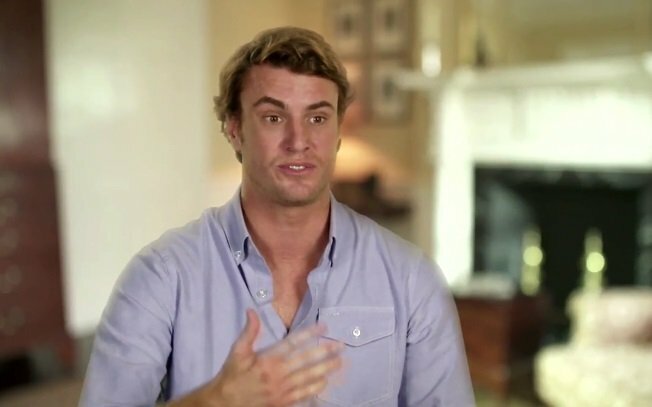 Honestly, when I first requested to recap Southern Charm, I certainly didn't think I'd enjoy it–I just wanted to have an excuse to chronicle the inevitable train wreck. However, I'm sad to see it come to an end. Heck, I even started to kind of like Thomas Ravenel (and, no, I'm not drinking!)! Cameran Eubanks is utterly charming, Whitney Sudler-Smith's mother Patricia totally stole the show, and Shep Rose, well, um, he's got great fratty hair. Even Craig Conover grew on me a bit, and I'm not totally ashamed that we will soon be alums from the same law school. We all know that T-Rav has welcomed a baby girl with Kathryn Dennis and is residing in Florida (though still planning to run against Lindsay Graham according to The State), and Cameran married herself an anesthesiologist, so I am not counting my chickens that there will be a season two. I guess we'll have to bask in last night's finale to dull the pain. The show begins where it left off last week, with Whitney's admission that he too hooked up with Kathryn around the same time frame as her "fling" with Shep and her pregnancy scare with Thomas. Prior to their con-bro-sation, the thirty second recap of the season courtesy of Cameran and Craig is pretty spot on and hilarious, I must say. Whitney tries to explain that he feels "dark and sleazy" for keeping this secret from his best friend, and he hopes that T-Rav will tread lightly in pursuing a relationship with her given his future political aspirations. Thomas looks gobsmacked. When did chicks start hooking up as often and as haphazardly as dudes? Southern Charm Recap: The Pregnancy Pact; Plus, Details On Cameran Eubanks Wedding! Before we start off with the recap, I'd like to congratulate Cameran Eubanks on her wedding this past weekend. My friend said it was a beautiful event–incredibly classy, but not the least bit pretentious, which is the impression I think we all get from the Southern Charm star. Guests feasted on barbeque and fried chicken while dancing outside at a plantation about an hour outside of Charleston. Cameran's dress was gorgeous, and my friend managed to snap a picture with Whitney Sudler-Smith. She said she didn't want to give Shep Rose the satisfaction of asking. As for Thomas Ravenel? Apparently T-Rav, Kathryn Dennis, and new daughter Kensington are now living in Florida so they were not in attendance. So, I guess he won't be throwing his name in the hat for the Senate race? Thanks for taking one for the team, Florida! Last night's episode had the gang heading out to Shep's family farm for some hunting and man time. Something tells me these folks shouldn't have access to firearms and Fireball at the same time. The show begins where last week's ended…with Kathryn storming out because T-Rav wouldn't defend her to Craig. J.D., Shep, and Danni are the only guests left, and Shep is dumbfounded that Craig (who is nuttier than a fruitcake in his opinion) would bring such drama to the meal. T-Rav then enlightens us as to the difference between people from the North and those from the South. Southerners will sleep around as much as they damn well please, but they would never talk about it at a dinner party! Danni explains to Thomas that Kathryn is hurt he didn't defend her honor. Luckily for T-Rav (and for anyone driving around South of Broad on the evening in question), a wasted Kathryn doesn't get far as her car has been towed. She sulks back into what's left of the party for more vino.